Rebuild Chile Game Chilean Videogame Developers Association (Chile), Chilean Videogame Developers Association (Chile), 2010 Play it Now ! You drive a bulldozer in order to evacuate dretitus. Thus, you let Chili rebuild houses. 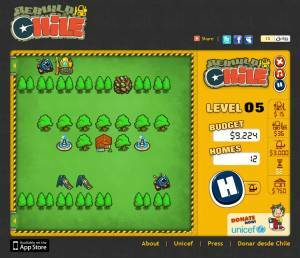 Game made for Unicef.